One of the places we stopped on Saturday was Don’s Collectibles on Main Street in Strasburg, Pa. Don runs a very cool little shop with a wide variety of collectibles, but of course I went for the baseball cards. I picked up a few shrink-wrapped bricks of cards from late-1990s sets that I had never collected – they were a dollar a piece and they each included a number of stars and some potential future Hall of Famers. But if you’ve been reading Paul’s Random Baseball Stuff very long, you know I’m going to focus on the Mets cards. And for a while, I was starting to think some Topps photo editor was a really big Yankees fan. The photo really isn’t the most exciting one you could find, but considering the era I’m happy John Olerud is shown in the Mets’ pinstripe jersey. 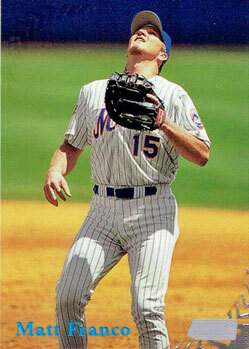 But let’s take a look at Al Leiter’s card from the same set. Really, is that the best photo Topps could find? 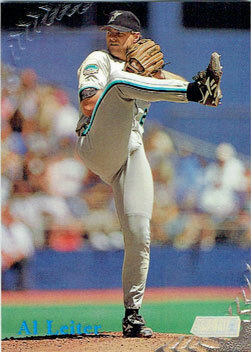 They did a better job when he was a Florida Marlin. Look what I found in the next pack I opened. 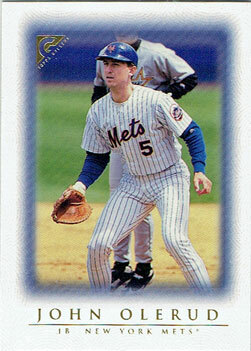 Let’s take a look at Matt Franco‘s card from the 1998 Stadium Club set. I know Franco was a part-time player, but a head back shot of him trying to catch a popup is not very flattering. 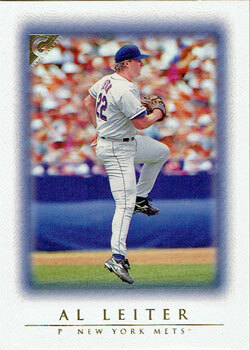 The next few Mets cards I found made me discard my photo editor conspiracy theory, though. 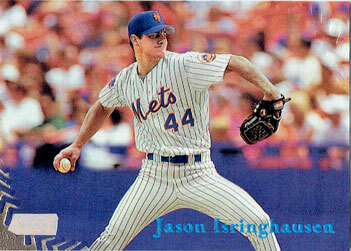 Jason Isringhausen got a classic photo showing him in the Mets’ pinstripe jersey. 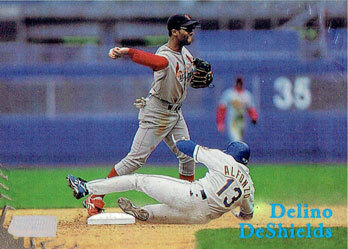 Edgardo Alfonzo made an appearance breaking up a double play attempt on Delino DeShields’ card. 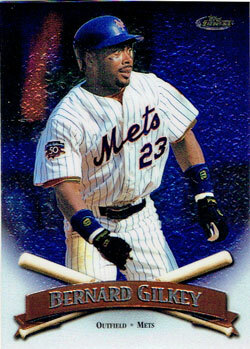 Bernard Gilkey has a pretty nifty baseball card in the 1998 Topps Finest set. 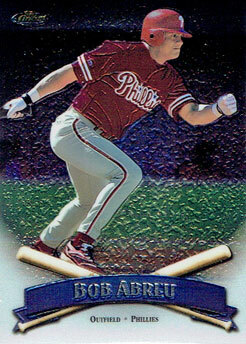 The recently-retired Bobby Abreu was one of the many former and future Mets that I found in the baseball card packs, but I couldn’t resist showing off a card from his first year as a Philadelphia Phillie — look how young he is!